Empty ebola ward in Nigeria. On July 20 a man who was ill flew on commercial planes from the heart of the Ebola epidemic in Liberia to Lagos, Nigeria’s largest city. That man became Nigeria’s first Ebola case—the index patient. In a matter of weeks some 19 people across two states were diagnosed with the disease (with one additional person presumed to have contracted it before dying). But rather than descending into epidemic, there has not been a new case of the virus since September 5. 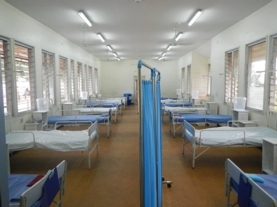 And since September 24 the country’s Ebola isolation and treatment wards have sat empty. If by Monday, October 20 there are still no new cases, Nigeria, unlike the U.S., will be declared Ebola free by the World Health Organization (WHO). What can we learn from this African country’s success quashing an Ebola outbreak? The swift battle was won not only with vigilant disinfecting, port-of-entry screening and rapid isolation but also with boot leather and lots and lots of in-person follow-up visits, completing 18,500 of them to find any new cases of Ebola among a total of 989 identified contacts. Thanks to the leadership of the Lagos State government under Fashola for pragmatic response before the Fed Govt came in. It would have been a different song now had the response not been immediate. The Federal Government also stepped in and with federal might, and the hands-on work of Lagos State officials working together on this important issue, Nigeria was able to stop ebola from spreading to horrendous proportions and by the success we have gained international recognition and acclaim. Of course we have to thank and remember the efforts of the late Dr Adadevoh for upholding the ethics of her profession till she died. Bravo to her. I wish a government teaching hospital is named after her as part of post humus national honours. Thanks v. much for this wonderful suggestion but we all know none is going to fly with the elites within the Nigeria system who are waiting to have every inch of the Nigerian soil named after them even after they’ve pillaged and taken what belongs to all for themselves alone. But what could one expect from a descendant of a family that has been giving to the Nigerian state from the very beginning! Like a very few families in Nigeria for whom “service” does not mean misappropriating what belongs to everybody, MOST descendants of the Great Herbert Macaulay would not be numbered amidst the despoil-ers with the hunters and gatherers primitive acquisitive instinct. While the son of the head of state of the most ravaged country by the EVD is pooh-poohing the idea of him returning to his country as a medical doctor where many are needed, this lady knew she had a son and a spouse and yet was in almost hand-to-hand combat with Patrick Sawyer to stop him from fleeing into the streets of Nigeria and infecting thousands who would, in turn, infect hundreds of thousands. We’d be buring thousands daily if not for that gallant patriotic younger woman. A teaching hospital would be a most appropriate thing to name for her effort and as a memorial to love of country: Stella Ameyo Adadevoh Teaching Hospital … anywhere, East, West or North. Regards, and thanks, as always.